My first amusement park was a gravel-covered block of unincorporated West Hollywood at Beverly and La Cienega called Beverly Park. The home of a ferris wheel, a merry go-round, a smallish steel roller-coaster, pony rides, and a host of tamer amusements, Beverly Park was what I dreamed about on cool LA weekends when the boat and the beach were out of the question. I’ll confess that I was more thrilled by the boats riding in a circle than I was the roller coaster, and I never tired of the park’s offering. it was a place where I could go where it was all about being a kid, where everything was designed, in the Disney-esque words of Beverly Park founder and owner David Bradley, to “bring life and laughs to people.” It was an innocent, almost naive mission, and Bradley succeeded admirably. The park thrived for nearly three decades, until fatigue and rising rents compelled Bradley to close. It never lacked for patronage. 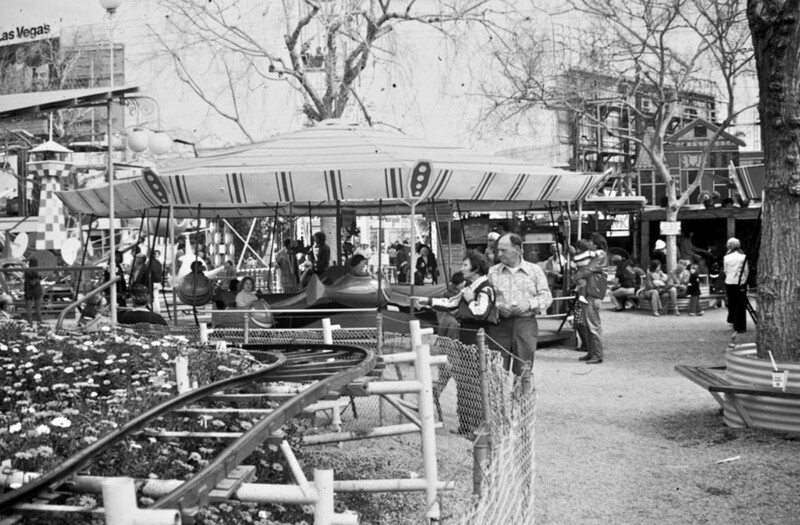 Hadley Meares, a writer and historian, dis a superb profile of the park on KCET’s website where she hints at the park’s appeal as a salve for the consciences of fathers who, for whatever reason, had few opportunities to spend time with their kids or who simply lacked other alternatives. That’s no doubt true, but it’s never the whole story. Some families, like ours, went there because the kids loved it so much and pestered our parents until they relented and took us there. Los Angeles lost something special when the park closed. In a metropolitan area that hosts four of the nation’s largest and best known theme parks, the closing of Beverly Park left a hole in the collective psyche. Over the past decade, that hole has begun to fill. The Balboa Fun Zone and the Pacific Park at Santa Monica Pier – and to a somewhat lesser degree, Belmont Park in San Diego – thrive because there is more to a great California amusement park than fear. Because a great amusement park doesn’t need to be a competition to see who can ride the highest or fastest roller coaster. The goal of a great amusement park is not the incitement of terror or the adrenaline rush that comes with fooling your hypothalamus into believing that death is imminent; that goal should be creating a space that is safe for fun, joy, and escape. Upon that simple premise David Bradley built his life and two successful businesses and earned the gratitude of two generations of Los Angeles families. It should incite no surprise that Walt Disney spent a fair amount of time sitting on the benches at Beverly Park taking notes, and he picked up on Bradley’s epiphany – or perhaps detected a kindred spirit. Walt and the wiser heads among his successors have managed to create, on a far larger scale, a place where not only children could enjoy being children, but where adults could do so as well without fear or embarrassment. My family have annual passes to Disneyland, and there are days when, perched beneath a shade tree in New Orleans Square, I wonder whether my son is just our excuse for coming to Disneyland and doffing our worldliness for a while. Beverly Park could never lay claim to being “the happiest place on Earth,” but it was and ever shall be one of my happy places. I reckon that I am not alone.